The Three Stages of Swallowing. In the first, voluntary, stage of swallowing, the cheeks are sucked in slightly and the tongue is arched against the hard palate, so that the bolus, or ball of chewed food, is moved to the pharynx. Normally, air is free to pass from the nose or mouth to the lungs and back again. But the moment the bolus approaches the fauces, the passage from the mouth to the pharynx, nerve centers are triggered that control a series of reflex actions. After one quick inhalation, breathing is halted for the brief instant of the next stage. In this second, involuntary, stage of swallowing, the rear edge of the soft palate, which hangs down from the roof of the mouth, swings up against the back of the pharynx and blocks the passages to the nose. The back of the tongue fits tightly into the space between two muscular pillars at each side of the fauces, sealing the way back to the mouth. Simultaneously, the larynx moves upward against the epiglottis, effectively closing the entrance to the trachea. Sometimes the larynx does not move up quickly enough and food gets into the air passage, stimulating a coughing reaction. With the one-way route to the stomach firmly established, however, the muscular coat of the pharynx contracts, squeezing the ball of food and forcing its passage into the esophagus. In the third stage, the rhythmic contraction (peristalsis) of the muscles of the esophagus moves the food on to the stomach. The cardiac sphincter keeps the stomach entrance closed until food is swallowed. As the food approaches, moved by the wavelike contractions of the esophagus, the advancing portion of the wave causes the sphincter to relax and open, while the rear and contracting portion forces the ball of food through the entrance. impaired swallowing a nursing diagnosis accepted by the North American Nursing Diagnosis Association, defined as a state in which an individual has decreased ability to voluntarily pass fluids or solids from the mouth to the stomach. /swal·low·ing/ (swahl´o-ing) the taking in of a substance through the mouth and pharynx, past the cricopharyngeal sphincter, through the esophagus, and into the stomach. the process that usually involves movement of food from the mouth to the stomach via the esophagus. Coordination of muscles is needed from the tongue to the esophageal sphincter. See also swallowing reflex. In the first stage, food is placed on the surface of the tongue. The tip of the tongue is placed against the hard palate; then elevation of the larynx and backward movement of the tongue forces food through the isthmus of the fauces in the pharynx. In the second stage, the food passes through the pharynx. This involves constriction of the walls of the pharynx, backward bending of the epiglottis, and an upward and forward movement of the larynx and trachea. This may be observed externally with the bobbing of the Adam's apple. 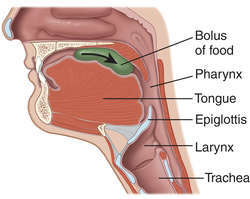 Food is kept from entering the nasal cavity by elevation of the soft palate and from entering the larynx by closure of the glottis and backward inclination of the epiglottis. During this stage, respiratory movements are inhibited by reflex. In the third stage, food moves down the esophagus and into the stomach. This movement is accomplished by momentum from the second stage, peristaltic contractions, and gravity. With the body in an upright position, liquids pass rapidly and do not require assistance from the esophagus. However, second-stage momentum and peristaltic contractions are sufficient to allow liquids to be drunk even when the head is lower than the stomach. Voluntary or involuntary swallowing of air. It occurs involuntarily in infants as a result of improper feeding. Adults may swallow air during eating or drinking. Abnormal functioning of the swallowing mechanism associated with deficits in oral, pharyngeal, or esophageal structure or function. A. how big is it? mouth ulcers has a reason why they happen. sometimes a broken tooth, biting a sharp metal, a prosthetic that doesn't sit well..that sort of things. but sometimes it is caused by other stuff. any way, oral hygiene may relieve some of the symptoms. Topical (rubbed on) antihistamines, antacids, corticosteroids, or other soothing preparations may be recommended for applying on top of the ulcer. Avoid hot or spicy foods. Clinical and cognitive predictor of swallowing recovery in stroke. Dysphagia, the medical term for swallowing difficulties, affects a substantial number of adults and older populations. If the problem involves the first three stages of swallowing, you may be referred to a speech-language pathologist (sometimes called a speech therapist), who can help you train your muscles to make swallowing easier. Dr Head added: "The world literature and an audit of screening practices in England and Wales highlighted a need for a universal way of screening for signs of swallowing impairment in patients admitted to hospital after having a stroke. It was at the New York rehab facility, where swallowing therapy was initiated, but unsuccessful. This stage of swallowing, the oral phase, is entirely under voluntary control via the cortical and subcortical areas of the brain. The remaining 3 studies did not select patients suspected of dysphagia, but did assess them for possible disorders of swallowing [8,11,12]. Residents and family members also appear to have a better understanding of swallowing impairment and risks after seeing the swallow anatomy in a 3-D color image. According to the company, the VARIBAR products are oral agents that provide adequate visibility of anatomical structures and the swallowing process during the MBS examination, and simulate different liquid and food consistencies to assess the type and severity of the swallowing disorder. 1) It has been used to investigate swallowing function over the past few decades. 21,22 The aim of early swallowing screening is not only to reduce risk of aspiration pneumonia and improve outcomes but also to assist the provision of adequate nutrition in a satisfactory and harmless way.